And this was the end of Kevin Rudd. It's the end, Labor will desperately hope, of the infighting that's marked the Rudd/Gillard/Rudd period. And the time since Hawke was toppled by Keating who handed over to Beazley who was followed by Crean; Latham; Beazley; Rudd; Gillard; Rudd. Personal ambitions above all, as I wrote in the Canberra Times today . . . This is the end, my friends, the end . . .
Is it an immutable law that all political lives must end in tears? Is it predestined that the fiercely kindled hopes will inevitably burn down until they’re nothing more than charred embers of disappointment? How can the ending; the hackneyed spectacle of a middle-aged man coughing out trite lies, be reconciled with the eager optimism of the beginning? Let’s take Kevin Rudd at face value. He was remarkable. Of all who’ve tried, he was just the third person to lead Labor to victory since the Second World War. His program was ambitious, inspiring and necessary. That platform, however, wasn’t just about escaping the financial crisis or the empty (but necessary) words of an apology: the country voted for something altogether far more inspiring. Remember? Action on climate change; a summit to determine a radical program that would guide us to the year 2020; and a whole new way of conceiving of notions of what a community means. What did we get? Rhetoric without change; buzz without accomplishment. 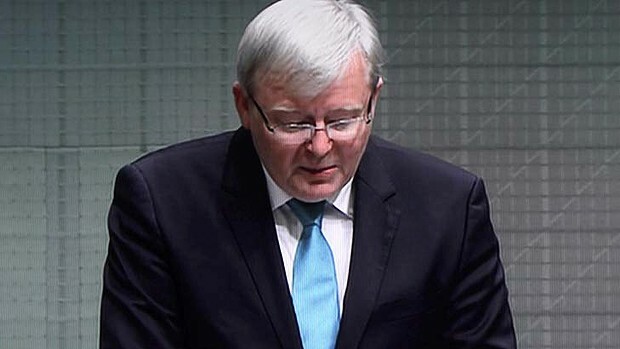 Rudd’s first government displayed the frenetic activity of an outback fly trapped in a lavatory. He zoomed back and forth, repeatedly smashing into closed doors and blank walls. He could see the light coming through the window, but couldn’t get to the other side of the glass. He was unable to escape the confines of the present. He didn’t have what it takes to translate ideas into reality. That’s why Rudd’s own colleagues toppled him in a near unanimous coup. Not just because he was arrogant and failed to consult, or their own avaricious desire – but because he proved unable to turn an excellent policy agenda into concrete reality. He’d failed. His program wasn’t being achieved and that’s why, after giving him every opportunity a politician could dream of, Rudd’s own party came to the realisation that his personal attributes were integral to the problem. Quite regardless of Julia Gillard’s own ambitions (and the ruthless cunning of plotters like Bill Shorten), if Rudd had been effective she could never have toppled him. Instead, critically, he displayed neither the ability to drive change nor to nurture good relations with his colleagues. He believed his own publicity. He thought he was an intellectual powerhouse: it turned out he was clever, but not brilliant. He believed he held the key to the future: instead he ended up like a drunk, continually pushing the key towards the door yet singularly unable to guide it into the lock. It took a couple of years, but that’s why his own colleagues decided they’d had enough. The plotters assumed garlic and a stake through the heart would be enough to dispatch him. It turned out they hadn’t watched enough Dracula movies and had completely underestimated his all-consuming desire. Rudd was determined that if he couldn’t possess the prize, no one would. But this alone wasn’t sufficient to destroy Gillard. Incompetent campaigning led to a hung parliament. Other Labor leaders in difficult times (think of John Curtin during the war) have translated that into triumph. She failed and was relentlessly stalked and destabilised by Rudd– always denying it – until, on the third attempt, he assassinated her. And then, a bizarre campaign reprise lasting not even a hundred days. Impersonating his earlier self, Rudd again strode the land promising a tax haven here, new fleet base there. A triumph of tactics over strategy. Nevertheless, Rudd saved the furniture and Labor held its nose while he savoured his own personal vindication. And the myth was repeated; that Rudd actually was a selfless genius who would lead us to the future. In the end he was the only person who seemed unable to recognise that defeat was inevitable. He probably even believed, back then, that he’d remain in parliament. Like Billy Hughes, the one-time PM who’d split Labor over conscription in World War One and remained on as an opposing frontbencher. Apparently the caucus meeting cemented his decision to leave. Nobody sought his insights and he wasn’t receiving the respect he believed he deserved. That’s why Rudd’s leaving a s--- sandwich for the person who once led the coup against him, Bill Shorten. An immediate by-election in a seat Labor’s destined to lose. Not even giving the party a chance of holding the electorate by giving a new Labor candidate a chance to walk the streets and allowing doubts to grow about Tony Abbott. At the last election Liberal candidate Bill Glasson outpolled Rudd, only finishing behind after the distribution of preferences. This time he’ll win easily. The Rudd/Gillard era closes. It hasn’t, alas, left a solid foundation for Labor’s return to office. The best that can be said is that now, finally, the party has a chance to rebuild. Our politics has come to be defined by the playing out of personal rivalries. This is good, terrific, when broad policy differences lie beneath the clash. It ensures that we get the best government available. But the past six years have been defined by shallow rivalry and squabbling. Thank goodness the country is finally moving on. And your final book on this subject is where ? After all, your existing Kev Rudd books don't cover the end finale ! How about an Australian title.... "Redback on the Toilet Seat - Labor's Poisoned Chalice' or "Kevin of the Never Never" or "Poor Fella, My Party". Poor Fella My Party - what a brilliant title! So much promise squandered in petty infighting over personal advantage. TO SPY, OR NOT . . .